The Seabourn Ovation restaurants are a foodies delight. They offer a gastronomic voyage through the cuisines of France, Japan and the local ports of call. There are five excellent restaurants, including two speciality venues. The food is mouthwatering - prepared from top quality produce which is often bought at local markets. There are five Seabourn Ovation restaurants. The Restaurant is the main dining room. There is also The Colonnade with an al fresco terrace as well as the new poolside Earth & Ocean restaurant. Sushi and The Grill by Thomas Keller are the two specialty restaurants. Each venue has a different style – from New York chic to poolside elegance – but together they offer a culinary voyage of discovery. The Restaurant is the main dining room. It is a breathtakingly beautiful space with high ceilings as well as coloured glass chandeliers. But what really makes The Restaurant special is the food – it was consistently some of the best I’ve tasted at sea. The Restaurant is open for breakfast, lunch and dinner. In the morning there are pastries, eggs and other breakfast favourites. At lunch there is a small but delicious menu. This usually has at least one fish dish. But in the evening things step up a notch with a wonderful French-inspired dinner menu. Each night the chefs present a wide selection of specials. These often reflect the cuisine of the ports of call. In addition, the menu includes dishes inspired by Thomas Keller as well as Seabourn classics that are always available. I especially enjoyed the Avocado, Artichoke and Orange Salad served with Bitter Greens and a Tangerine Vinaigrette. The Oven Roasted Rack of Lamb was also excellent. When you have dinner in The Restaurant you can mix-and-match from the menu. Also, like all the Seabourn Ovation restaurants French champagne and fine wines are poured free of charge. The Restaurant has open seating which means you can dine when you like and with whom you like. Reservations are not needed. On formal nights The Restaurant has a formal dress code. 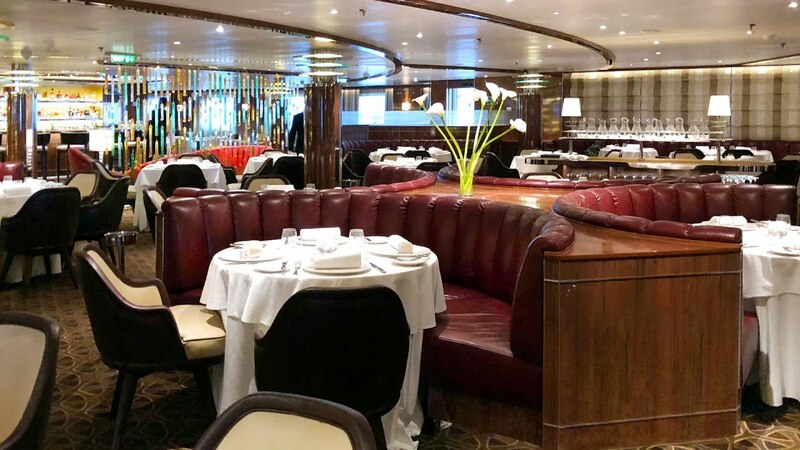 The Grill by Thomas Keller is one of two speciality dining venues on Seabourn Ovation. It is a classic American steakhouse with a chic New York twist. The decor – which includes a spectacular silver staircase set against a golden mosaic wall – was inspired by designer Adam D. Tihany. 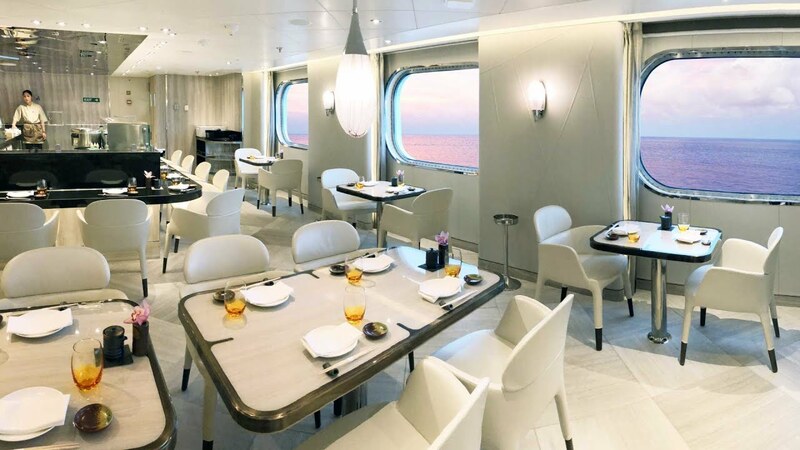 While for the menu Seabourn teamed up with Michelin starred chef Thomas Keller. Chef Keller has updated classic dishes, like Lobster Thermidor served out of the shell with a lobster foam. There’s Elysian Fields Farm Lamb Medallions with Herb Crust as well as Dover Sole and daily specials like Steak Diane. One of the most popular starters is the Caesar Salad with fresh anchovies – it is a real winner and is prepared at your table. Lobster Thermidor as served in The Grill. The whole Roasted Free Range Chicken with Thyme Jus is also a highlight. The preparation takes two days and the Roast Chicken is carved table-side. It serves two people. The Grill also offers a small yet delicious dessert menu with treats like Seven Layer Coconut Cake and Dark Chocolate Layer Cake. Be sure to leave room for a signature Thomas Keller cookie at the end of the meal! The Grill by Thomas Keller has a great choice of old and new world house wines to compliment the menu. There is also an extensive specialty wine list. The Grill is one of the most popular Seabourn Ovation restaurants so I recommend making your reservation online before you sail. 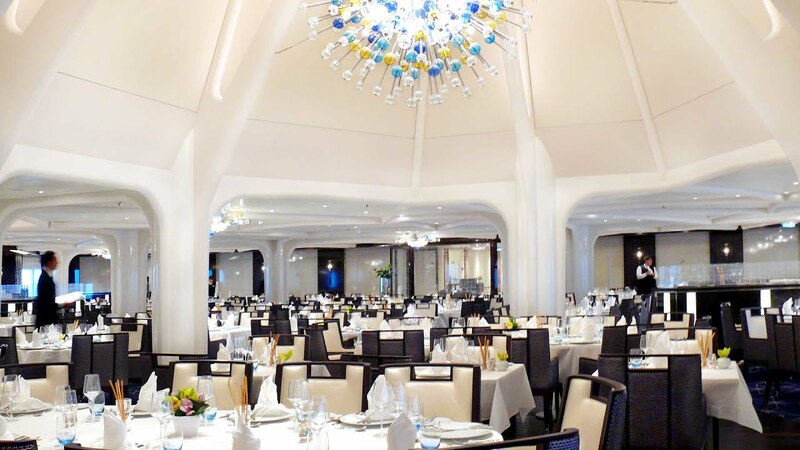 There is no additional charge to experience this great Seabourn Ovation restaurant. Sushi is the other speciality dining venue on Seabourn Ovation. It is a small restaurant with exceptional quality Japanese cuisine. The menu is so authentic it could come direct from Tokyo with sushi, sashimi and nigiri. The staff are happy to help guide your selections. Like the best restaurants in Tokyo, the quality of the produce is outstanding. Hamachi, tuna and other fresh seafood is flown from Japan and served a each night. Indeed, the eel, octopus, salmon and tuna were all superb. A great selection of hot and cold sake is also available. In addition, there is a good choice of the house wine and beer as well. But it’s worth noting that Sushi restaurant does not serve coffee as it is not part of Japanese cuisine. Bento boxes are served at lunch time in Sushi restaurant. Sushi is also open for lunch, now serving an expanded selection of bento boxes. These include teriyaki chicken, miso salmon, tamarind-glazed mushrooms and gyoza pork dumplings. There is also and a mince pork ramen bowl. Sushi is a healthy lunchtime alternative. Sushi restaurant does not require reservations. Also, there is no extra charge to eat there. However, the restaurant has limited seating and is popular which means you might need to be patient. Earth & Ocean at The Patio is Seabourn’s brand new al la cart poolside restaurant. The menu was developed by consulting chef Anton Egger. Indeed, it was inspired by his travels around the World. Earth & Ocean is the newest Seabourn Ovation restaurant. The Earth & Ocean restaurant transforms the poolside patio each night. There is designer ceramic ware, a candlelit ambiance, friendly table service as well as spectacular sunsets. Earth & Ocean is full of surprises, like the smoked tuna dip delivered to the table in its own tiny smokehouse! The Penne Pasta with Homemade Spanish Chorizo, Peppers and Basil also impresses. Shrimp Tempura with Pickled Mushroom as served at Earth & Ocean. Earth & Ocean also has other delectable bites like Iberia Ham with Melon, Fennel and Feta Salad as well as Bacon Wrapped Branzino fish with Curry Butter Sauce. I enjoyed the Shrimp Tempura with Pickled Mushroom, Ponzu and Sriracha Mayo. In fact it’s all great stuff and an excellent addition to the other Seabourn Ovation restaurants. You can choose to share dishes or they can be served individually. Reservations are not required for Earth & Ocean at The Patio. The relaxed Colonnade restaurant on Seabourn Ovation sets new standards for gourmet buffet dining. The Colonnade offers a relaxed buffet meal service. There are salads, seafood platters, hot roasted meats and delectable desserts. Everything is fresh, plentiful and well presented. The Colonnade also has a range of daily specials too. There is comfortable seating inside, as well as on the teak terrace where you can enjoy spectacular wake views. The Colonnade is open for breakfast, lunch and dinner. You do not need to make reservations. The author sailed as a guest of Seabourn.